Though most people might disagree with me on this, I strongly believe Oritsefemi should be given more credit than your favourite man, Banky W.
I know Banky W and his wife, Adesua stole all the attention because of the class, but Oritsefemi gave a good account of himself as well. We were just too ‘blindfolded’ to see the things he did. While Banky W went to South Africa to hold his white wedding, Oritsefemi didn’t abandon our beloved country. He understood that Nigeria was good enough for his wedding. He would have done the same since he has the money, but he felt most people won’t be able to witness his special day if he had taken it outside the country. In a recent interview, when he was asked why he chose to do have his wedding in Nigeria, he said, “People who are very familiar with me know I am a man of the people. Most of my fans and friends reside in Nigeria and I want them to be part of my special day.” Is that not nice? He had the interests of his people at heart and he made sure he didn’t disappoint them. Banky and Adesua Despite the noise and the elaborate wedding Oritsefemi did, he must have spent a lesser money than Banky W. Though it was gathered that Banky W’s white wedding in South Africa was a sponsored one, there is no proof. If one imagines how much they spent to put everything together, the money may be enough to pay workers of a state for a month or more. Since he did his wedding in Nigeria, all that Oritsefemi used in putting things together were gathered here. In a way, he provided jobs for the pretty ushers, hardworking waiters, event planners and others that provided services at his wedding. But I don’t think anyone in Nigeria benefited from Banky W’s wedding to Adesua in SA. When he thinks of the cost of taking service providers to South Africa, he would rather stick to hiring South Africans. Oristefemi Also, remember that Orisefemi’s wedding was not different from a carnival. He was ready to feed everyone in Lagos. If you think it is easy to feed the number of people Oritsefemi fed, you may want to replicate his wedding. How on earth did he convince an educated lady to marry a street boy who already had two children for two different women? That is amazing, as we all know that educated women prefer educated men. 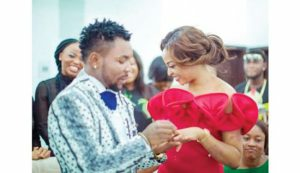 0 Response to "Why Oritsefemi’s wedding deserves more applause than Banky W’s wedding"